Umling La – How to Plan your Trip and Reach There? Last year, a few images went viral among travel and adventure enthusiasts; of a new highest motorable road in the world. It was, once completed, speculated to cross over Umling La at 19,300 feet, thus making it the new highest motorable road in the world; and Umling La as the new highest motorable pass. The road connects the villages of Chisumle and Demchok in southern Ladakh; running a total length of 21 – 24 kilometers. This immediately became a craze and almost everyone wanted to conquer this world’s highest motorable pass. The road was still under construction in 2017 but a lot of people still managed to get there from Hanle.If you too are thinking about traveling to Umling La; then in this article, I will provide information on how you can plan a trip to Ladakh while including Umling La in your itinerary; or in short, how to reach Umling La Pass from Leh. I would like to thank Rohit Mishra for providing all the necessary information provided in this article. He along with his team successfully conquered Umling La with his team and was kind enough to share the details with others. This new road has become a sensation among people traveling to Ladakh; both the ones who have already been there once and people going there for the first time. In all my years of blogging, I do not believe I have received so many queries from people asking about Hanle as I did ever since Umling La became known. It will not even be wrong to say that this one pas has made the entire Changthang Valley and Hanle as a popular tourist destination. Everyone now wants to go this way and conquer the highest motorable road in the world; as it was once the case with Khardung La. For a brief history, Khardung La for a long time wore the crown of being called the highest motorable road in the world. This claim however always remained disputed as other passes at an even higher altitude came in to light. Whether or not these other passes were motorable was a big question though. Later on, even the actual altitude of Khardung La came in to dispute. The signs at the summit claimed it to be at a height of 18,379 feet; however the actual highest elevation of the road was at 17,582 ft. It is believed that the original mule track across the pass was at the claimed height of 18,379 feet but the metaled road never rises above 17,582 feet. There were several other competing claims for this title after Khardung La lost the battle. Semo La in Tibet has an asphalted road at a height of 18,258 feet which is used by trucks and buses regularly. All the other claimants were all gravel roads but were in use by Army trucks, and thus motorable. Marismik La at a height of 18,314 feet for a long time remained to be a prime competitor. Later, Mana Pass in Uttarakhand came to the front with its highest elevation of 18,192 but the road before the actual pass rising to even an higher altitude of 18,406 feet. In the end however, it was Shipki La in Spiti that stole the glory with 18,698 feet. Now as it would seem, the time of Shipki La too is over; as the new road across Umling La Pass will rise to an astounding height of 19,300 feet; exceeding all other passes by a huge difference. Umling La Pass is located at a distance of 108 kilometers from Hanle; in the direction of the village of Demchok; in Changthang Valley of Ladakh region. Depending on the route you take; total distance between the city of Leh and Umling La Pass is about 350 to 400 kilometers. From Hanle, it will take you about 4-5 hours to reach Umling La top; depending upon your speed and breaks. From Leh, it is a minimum of 2 days of journey. I have suggested an itinerary further in the article. Below is detailed route map of Umling La Pass. It actually covers the entire region between Leh and Umling La so you can easily figure out which road to take until there and what your itinerary can be. Due to the large region that the map covers, I am putting a thumbnail here on the article page. Please click on the link below to view a full size copy of the map. Also read: When is the Best time to go to Ladakh? In case the map below gets resized when you download; or is coming out a bit blurred; or you would like to download it in its original resolution, you can do so from the Google Drive link I have provided below. There are several routes that you can take to travel from Leh to Umlingla Pass; as you can I am sure already figure out from the map above. It will majorly depend on three factors. First one is how many days you have in hand. Second is how you are traveling and third is your itinerary. In all of the cases however, in order to reach Umling La, you will have to reach the village of Hanle. From Hanle, there are two routes that you can take to reach Umling La top.One goes via Photi La running a total length of about 108 kilometers; while the other one goes via Ukdungle running a total length of about 104 kilometers. I will cover both these routes in detail further in the article. The first stop to plan a trip a Umling La is the small hamlet of Hanle. There are three ways to approach here. One is via Pangong Tso; second is via Chumathang and the third one being via Tso Moriri. Some time ago I wrote an article on how to plan a trip to Hanle where I have covered all these routes in details. Link to that article is provided below. I would request you to please take a look at the article above to understand the routes in details. Adding that information here as well will result this page getting way too lengthy. However, for a brief overview, these are the most common routes you can take to get to Hanle from Leh. Of the 5 routes above, the one via Chumathang is the only the by which you can reach Hanle on the same day. Traveling by this road; total distance traveled will be about 255 kilometers in about 10 to 12 hours; depending upon your speed and the breaks you take. Rest all the other 4 routes are 2 days journey; with a night stay at either Pangong Tso or Moriri. For getting Tso Moriri, you can either reach there via Chumathang or can also take the route via Tso Kar. If you need further details on this, please feel free to ask in the comments section below. Once you are at Hanle, there are two different roads that you can take for your journey to Umling La. The first route is via Photi La as explained below. This of the two is actually the tougher one that will take you across Photi La first before you finally make it to Umling La. I will recommend an early start from Hanle village as the route will be tough at several stretches and you will also be crossing rivers / water streams before you finally get to Umling La. From Hanle, take the road towards Photi La top which is about 35 kilometers from Hanle. The board there would read 28 kilometers which is not true. If you keep on the road and do not take any short cuts, the entire stretch till the top is about 35 kilometers. This entire section of the road is a dirt travel with lose gravel with last 5 kilometers a very steep climb. From Photi La top, the road will again start climbing down. Traveling about 22 kilometers, you will reach Photile which is really nothing but an Army camp (BRO). Stop here for a moment and if required, get yourself registered. While you are on the descent, you will come across a spot where the road will bifurcate in two. The stretch towards your left will take you to Koyul which is a restricted area still. So make sure that at this spot, you turn to your right to reach Photile BRO camp. The dirt trail continues downhill as well and road condition will remain bad. It will be dirt, mud, stones and lose gravel all around. This is where it gets tricky and the real fun starts. After Photile, you will be playing hide and seek with Indus river and will also be crossing several water streams. The road condition however will get a little better. At Photile, the river will be to your left. After traveling a few kilometers, you will cross the river for the first time post which it will shift to your right. Continue for another 7 kilometers and then you will come across another bridge to cross. After this bridge, the river will again be on your left. Continue for another few 5 kilometers and you will come across another bridge that you will have to cross. Make sure you cross it and get to the other side because across the bridge is the road to Umling La. If you do not cross over and take the road straight ahead, it will take you to Ukdungle. I know I used the word “bridge” but in reality, there is no bridge. They are all under construction and it will actually be the river you will cross. Pictures below should explain better. This is what you will cross on the way. After you cross the bridge, turn right and from here it is a straight run to Umling La Pass. The pass is about 38 kilometers after this bridge of which, 24 kilometers is good road and rest is under construction. You must remember here to turn right and not go left. This is the second road you can take to reach Umlingla from Hanle. Route will be as below. This is actually the easier of both the routes. Road from Hanle till Ukdungle is a freshly laid tarmac of 35 kilometers. After Ukdungle, road remains to be Ok and you continue another 18 kilometers till Nerbole, also known as Nurbu La or Nerbo La. After Nurbu La, the condition deteriorates for another 13 kilometers till the bridge which I mentioned right above, the last one that you cross to go towards Umling La. This time however, since you are coming from the other direction; this bridge will be on your right and will become the first one to cross. You will get over this bridge, take right and continue to the pass. To be quite honest, Umling La is not really that steep of a climb and neither the road is too steep or narrow. I guess this entire region is at a quite high altitude; and the final climb to the pass after you cross the bridge over is spread over 38 kilometers making it a lot easier. The entire valley around and the roads are quite wide and it never gets dangerously narrow most of the times. The road via Photi La till Photile however is horrible. It is all lose mud, stones and gravel making it a bit tough. If it rained in this region, I seriously think you will need a 4×4 vehicle to jump the pass over. Even bikers will face difficulty to cross it at this time. Apart from the pictures of water crossing, a couple more are posted below. From Ukdungle however, the road is quite good except for the 13 kilometers stretch between Nerbo La and bridge crossing. Picture below is of road between Hanle and Ukdungle. The real fun however is between Photile when you cross over the bridges. These bridges are all under construction and you will actually be crossing the river at several places as shown in the pics above. Umling La is located dangerously close to India China border due to which access to this area is severely restricted. Indus river flows quite close to the pass and the road leading to it; and the entire region is extremely remote. Once you leave the village of Hanle, you will not come across anyone except for gentlemen of BRO division of Indian Army. There is really no specific permits needed to visit the pass apart from the regular Inner Line Permit. Do remember to mention it on the permit though that you intend to visit the Hanle, Photi La, Umling La and Ukdungle route or you may get stopped. This year, a lot of people will be traveling this way so the situation related to permits may change; but as of last year, the regular Inner line permit worked fine for Umling La as well. As a matter of fact, in 2017 there was no check post as well anywhere in between; just the regular BRO camps but they did not ask anyone to produce the permit. This will highly depend on what your current plan is but if you want to include Umling La in your trip, then below is how you can plan it. I will suggest an itinerary from Leh to Leh. This of course cannot be applicable for everyone but should at least give you an idea on how to go to Umling La. If you follow the above itinerary, you will have to seriously think about fuel arrangements because once you leave Leh, there is no other petrol pump en route. For visiting Umlingla Top on Day 4, you can reach there via Photi La route and return via Ukdungle; or do the journey the other way around. Go to Umling La via Ukdungle and take the route across Photi for journey back to Hanle. None is the word that I will use here. Once you leave Hanle, there is absolutely nothing but miles and miles of barren Ladakh. There is no Dhaba anywhere, no restaurant and definitely no place to stay. You must make it a day trip and return to Hanle before it got dark. At Hanle however, there is a guest house by the name of Padma Homestay which is run by a gentleman Mr. Sonam Dorjay. Their homepage is http://padmahomestay.in/. Since this is the only place to stay at Hanle, it is very important that you make advance booking which you can at their site from the link above. If for some reason you were unable to make reservations, then you can stay at a house of any of the local as a paying guest. Before you start from Hanle towards Umling La, make sure that you are carrying something to eat and water to drink as you will not find any other place where you can hope to get food elsewhere on this route. There is no petrol pump anywhere, no ATM, no bank and no hospital. The nearest medical aid you can get is either at Hanle or Rhongo village but that too will be just basic. In case of an emergency, the army camps should be able to help. It will be wise to carry some basic medicines or a medical aid kit of your own. If you have any medical condition that may turn serious, do not go towards Hanle at all. The only time you can visit Umling La is between late May till September, or maybe early October. In all other months, the entire route will be covered under snow and not accessible. Best of these will be September or early October. If you went there towards June, you will find melting snow creating mud, slush and water streams which will become a problem considering the bad roads. After Monsoon arrives in July and August, situation will become even worse. September hence will be perfect for going this way. With that said however, not everyone can travel in September. If you are going in other months, just make sure your vehicles are well prepared for the bad road ahead and go very carefully. In terms of motorcycles, a Royal Enfield will be a preferred choice but others can serve the purpose as well, provided that they are well maintained. For a car however, you must travel in an SUV only. It doesn’t necessarily have to be a 4×4 but high ground clearance is must. The climb of Umling La is not that steep really so if you are able to cross Photi La, then the only hurdle on the way will be broken roads and water crossings. Another choice can be to take the easier Ukdungle route. If you have a 4×4, then take either of the routes. The mighty Umling La is located at a staggering height of 19,000 Feet or 5,883 Meters. The entire region is extremely windy and cold. The wind will continue to blow on your face all day long and you must prepare accordingly. Take a heavy windproof jacket and apply some cold cream or lip balm to protect your face from the wind. Good quality gloves and waterproof shoes of course are must if you were riding a motorcycle. I think that pretty much covers all the information you will need to visit Umling La. If you have any further questions; or need any further details; please feel free to ask in the comments section below; or at our Community Forum; and I will be glad to help in any way I can. Hey Vargis.. Is it possible to visit Umling la this year in june first week? Planning to take route sarchu-Tso Moriri-Hanle and Hanle-Umiling la-Hanle? Umling La is still out of bounds for tourists Rohit. We will know more only tourist season begins in Ladakh but as of now it is a no. Hi is this post alive ? I will be going to umlingla from kaza. Where should I take permit. ? How is route from kaza to hanale ? There is no direct route form Kaza to Hanle. You will first have to reach Leh, get your permits from there and then go to Hanle. Hope you are doing well ..!! I am planning for a trip to south of Ladakh in August last week . According to the current situation will I get the permission for Hanle and Umling-la during that period..? If not them which would be the best and less explored place to vist.? And is it possible to get permit for Siachen base camp.? 3. Siachen – You can try to get the permit, see the article below please. hey brother..will u plz put some light on current road condition of pnagong-man-marak-chusul-hor la-mahe-tsomoriri? is this doable in a day? Permits for this route as of now are suspended Anup Bhai, you cannot go this way. Khaan saab, last year i asked u one question before my leh manali bike ride, that where to camping and tanting on that highway, thanks for that reply @ last year. This year i got a question regarding umling la pass, that i saw some videos about umling la. Riders are saying that special permissions are needed to go over there. Is it really true? Or permit from leh tourist is enough for umling la hanle route also. And yeah we gonna be riding in upcoming may last week from pangong -man – merak -chusul -mood – hanle. And than photila- umling la. Is that recommend? And is there any place where we can find petrol(even from localised) ? Tapu Bhai – Umling La is off limits, no permits issued and no tourists allowed. Please see this post. Hi fellow riders, I’m planning a leh bike trip and umlingla will in route . looking for any solo rider or group to join . Umling La may not remain open for tourists this year, more details to follow as I get clarity on this in coming weeks. Hi Bishnu – Umling La is off limits, at least for now. Highly unlikely that they will allow any tourists this way this year. I heard Umlingla Pass is restricted and tourists are not allowed. Is this true? I’m planning this on the month of September..
Hi Vishwandadhan – Yes it is true. Cannot travel to Umling La as of now. I’m planning solo, I shall join you. Let me know the iternary and do contact me. I am planning a road trip to Leh. I am visiting Hanle & inspired to visit Umling La by this article. Will I be able to visit Umling La around 26th May 2018 ? will it be open? Hello Pranay Ji – Yes you will be able to visit Hanle and the pass towards May end. can you plss… tell me that where i can get a petrol pump in between hanle to manali??? bhai pangong se marsimik la kese ja sakte hai?? merko umling la pass ya marsimik la dono me se ek karna hai june me! one more question vergis bhai….do we need any special permit for umling la pass??? Nahi Bhai. Just mention the Hanle – Photi La route on your regular ILP and that will do. 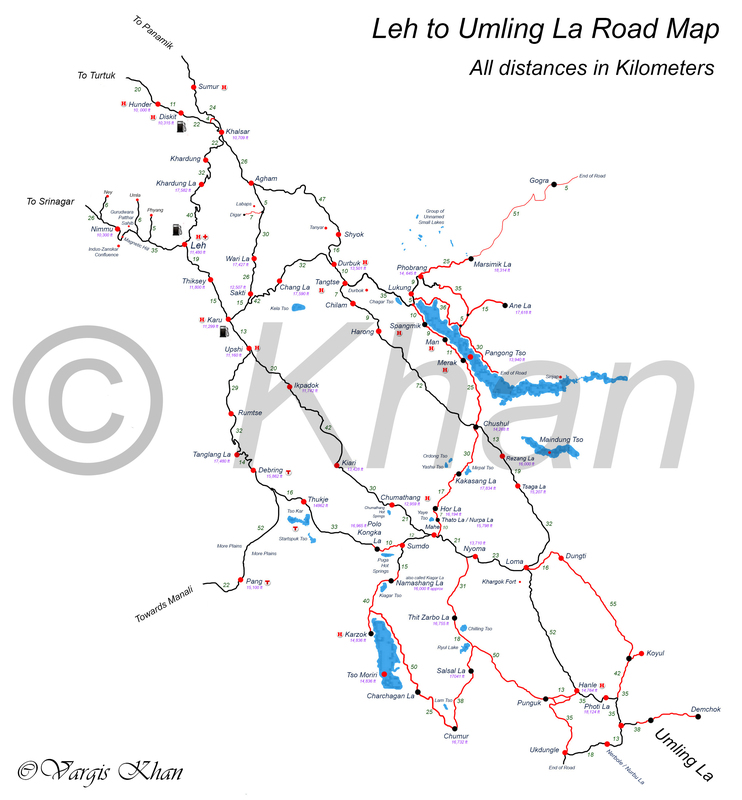 Shiv Bhai for Marismik route, please take a look at the complete Ladakh map I created and posted at the link below. thanx bhai….help kardi aapne bht badi. i think it should be around 750-800 kms? Anup Bhai it will be between 850 – 900 kilometers approximately. If you are worried about fuel for such a long ride then see the post below. May i know what is the distance between hanle and umlingla ??? Distance between Hanle and Umling La is approximately 108 kilometers. Rohit Bhai I am sorry but I did not know this was your information. Someone just mentioned this in the comments below and I added it to the article.I have edited the article now and credited in your name. You are welcome and thank you for taking the time to drop a note. Amazing work vargis. Really loved your enthusiasm. i got some information . You don’t need any special permission to reach Umling La. Normal permission would work which will cost you 400 rupees and you do not require any army contact for this. There are 3 way to reach Umling la. Download offline map before you start so these coordinate will take you the pass straight away. Via koyul you need permission as mentioned above. 1. Hanle to Photi La 35km if you don’t take short cuts. The road sign shows 28km from Hanle but that is an incorrect figure. 2. Photila to Photile village is 22km: There is no one just a bro post and they are very helpful they served us juice , eggs , lunch also. 4. From 2nd water crossing Umling la is 38km where in 24km road is Mattel road and 10km is under construction. Hanle to ukdungle 30km a trail way. Thank you for sharing this information brother. Updated the article based on your updates. Hey is there anyone can tell the complete route of umlingla pass from manali. You will have to reach Hanle or Koyul first I guess in order to reach there. Will wait for someone who has been there to advise the route from Hanle / Koyul to Umling La. This is full coverage of umlingla la. I have been their recently in August ,road is under construction , snawfall there in August also.. love that place…. Do share some pics of the pass brother. Not a lot of people have been there yet. I neve found the Distances between Khardung La and Umling Laa? can general public visit the Umling La pass? what is the suitable time to visit? Few people I believe have already been there so somehow they did manage to get the permit. I’m not entirely sure, but after long eye-straining on Google Earth, I see a dirt track running east of Photi La, cutting directly to Demchok. Google Earth shows an altitude of around 5800 ish meters, close to the altitude of 5,900 meters stated for Umling La. I could share the co-ordinates of my find: 32° 41′ 22.83″ N, 79° 16′ 06.61″ E. Hope this helps further finds. Cheers , hope we can gather some more info, the guys in the vieo speaks about the permission required. I want to go there also. I also found route (Delhi-Jammu-Akhnoor-Mughal road – peer ki gali- Srinagar- Rajdhan- Gurez-Telail-Shekhopora-Lolab-Dhoodhpathri-Sadhna- Tithwal- srinagar-Leh-Hanle-Umlingla- Hanle-Chushul- Spangmik-Karu-Debring- Pang- Manali-Jalori-Delhi. Vargis ur blog is among the most informative one. i think u should mark the LAC on the map that u post. There are many who are planning. A wrong turn on the dirt track and u could cross the border where it is not manned in some places. The marked point is in china in the map above. We only have a village across on our side of Demchok. Geez! :-O Roads seems to be literally reaching for the skies! And someday there could be a road passing the summit of Everest too….who knows!! Anyway, high adventure always beckons the adventure seeker! Always has, always will!! Cheers!